Motherwell and Wishaw MSP John Pentland this week called for Scottish Government action on public transport issues affecting his constituents. 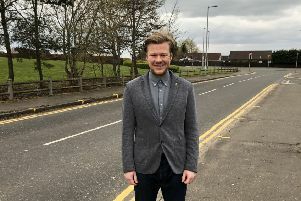 Mr Pentland said he has received numerous complaints over rail timetable changes being brought in by ScotRail this weekend which will significantly and adversely affect journeys to and from stations such as Wishaw and Shieldmuir. He said: “Those who have written will of course be the tip of the iceberg. Hundreds of others, many of them daily commuters, will be infuriated by these changes that have been portrayed as service improvements. “To my constituents, they are anything but, and understandably they view this is a cost cutting exercise on a captive market. “The changes ditch a busy express service, lengthen train and other aspects of journey times, and the trains that remain are at less convenient times, all of which adds significantly to peoples’ working day. Mr Pentland and Motherwell and Wishaw MP Frank Roy - who has also spoken out on the issue - are jointly seeking a meeting with TransportScotland to discuss the situation. Mr Pentlamnd also said he is setting his sights on better bus services. He said: “Many people depend on buses for public transport. Bus services are frequently reduced while fares rise, but there is little support or regulation from the Scottish Government. “Part of the problem is the deregulated bus market put in place by the Tories in the eighties. That is why I am supporting Iain Gray MSP’s Bus Regulation (Scotland) Bill. This will give local councils and SPT new powers to control routes, timetables and fare increases. “People often comment on how good London bus services are. That’s because they were never deregulated. Motherwell and Wishaw deserves decent bus services too.